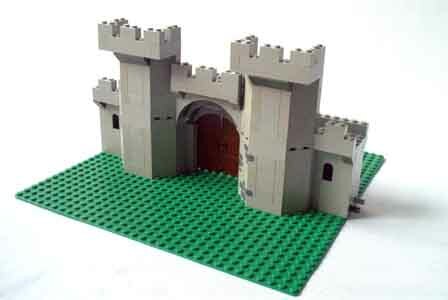 The Classic Castle City standard (or CCC as it is commonly known within the community) is a modular building standard for creating joint Castle-themed displays. It allows medieval-style buildings by several different contributors to be densely packed together in walled towns or villages. 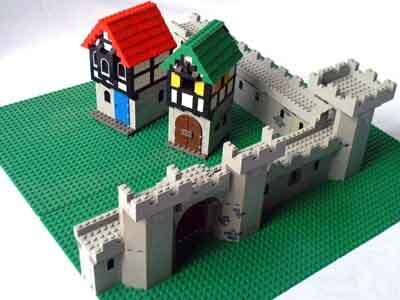 An early attempt to create a Castle-themed modular building standard was something called the Medieval Marketplace which debuted in the fall of 2002. This standard allowed individuals to group their creations together into a more or less cohesive whole but had obvious limitations for creating large-scale displays. At BrickFest 2003 a roundtable discussion focused on how to create an over all standard that would take some of the ideas contained within the Medieval Marketplace concept but go further in creating medieval-themed displays on a larger scale. The limitations of the CCC eventually gave rise to two different attempts to formally expand the standard to include landscaping. The first, the CCC farm standard was proposed by Ben Ellerman in the Summer of 2006. It basically suggested going back to a smaller baseplate size for land outside the walls. The most recent addition to the CCC has been the Base8 proposal created by Brendan Mauro and first debuted at NWBrickCon 2006. This proposal introduced two concepts to the discussion: BPB (Baseplate plus Brick) and 8cres. Using smaller units and focusing on the vertical rise and fall of terrain the system is intended to allow for well-designed landscapes. Although seemingly very popular the system has not yet been accepted as an official part of CCC. This may be, in part because it changes the basic module design too much for some Castle builder's comfort. There are several component parts of the CCC. The first two components form the core of the current standard. The other components are optional but greatly expand the building options and variety of terrain in a display. CCC standard gate built into a wall section. From Brickshelf Copyright held by Brickshelf user glencaer. The CCC wall standard creates the outer defensive walls and fortifications of the city and is based on 32x32 baseplates in either straight and corner module configurations. Wall is a misleading term as the modules can include keeps or gatehoues or indeed any structure so long as it connects to the modules on either side. Walls are built on a four-stud deep foundation centred on the baseplate and either travelling straight across or turning at a 90 degree angle in the middle to create a corner. The total height of the basic wall module is 8 and 1/3 bricks high. This includes a two-brick high wall on top of a single 6xX baseplate to create a battlement that overhangs the wall by one stud at front and back. This leaves a four-stud walkway for troops along the top of the wall. The remaining wall height (6 bricks) is conveniently the height of the standard castle wall pieces although there is no requirement to use these pieces in constructing a module. Modules are connected at the base of the walls using technic pins. CCC standard buildings in typical Tudor-style inside city walls. Buildings that are not connected to a wall piece are literally independent. Each self-contained building is built upon its own plate of whatever size the builder feels is appropriate. Once the walls are assembled the buildings are simply arranged as the display co-ordinator sees fit to create a pleasing display. The CCC farm standard is built on green, brown or tan baseplates whose dimensions are multiples of 8 studs (ie: 8x16, 16x32). Plates are placed on top to create variations in elevation to indcate ploughed or planted fields. There is no standard elevation or way to connect farm modules although rock walls are suggested to divide individual fields. The Base8 modular landscaping standard is a system that is often used to add landscapes to CCC displays. Base8 uses baseplates whose dimensions are multiples of 8x8 stud sections called 8cres (8x16, 32x32). Built on top of baseplates plus brick (BPB) modules can include not only wall sections but roads, rivers hills and cliffs which rise up in multiples of 8 bricks. An ingenious system of risers allows regular CCC wall modules to align with Base8 modules. A simple conversion of wall sections can also be done quickly to convert CCC to Base8. Classic-Castle.com hosts the official standards and discussion forums where amendments and additions are discussed. This page was last modified 11:47, 26 February 2016 by Brickwiki user Claude Bombarde. Based on work by Ted Godwin and Larry Pieniazek.